In this third post explaining my PixInsight workflow, we'll be taking a look at dealing with Dark Current by creating and applying dark frames using a Canon EOS 500D. I think it is fair to say that creating a good master dark in order to calibrate flat and light frames is one of the more challenging parts of the image acquisition process when using a DSLR. There are many mysteries, a fair few myths and indeed some question as to whether DSLR users should bother with dark frames at all. Firstly though, it is worth reminding ourselves of what "Dark Current" is. Camera sensors create an image by measuring electrons that are displaced in to the sensor's electron wells as they gain energy from incoming photons of light. Unfortunately, those electrons can also gain energy from heat in the sensor. Some of this heat may be come from the local environment and some will be generated by the sensor electronics. This process occurs in all exposures, even if the sensor is completely shielded from external light, hence the name "Dark Current". Read on to find out about my method of tackling the problem. (If you've arrived part way through, start the series here with Bias Frames). So the first objective of calibration using a dark frame is to accurately reproduce the fixed pattern created by the dark current and subtract it from our image. The standard process when using a set-point cooled astronomical CCD is to cap the camera with a light-proof cover, cool it to the same temperature as used to take the light frames and shoot a series of dark frame exposures of the same length as the lights. Since no light has hit the camera's sensor, any values in the resulting dark frames must be there as a result of the dark current (plus the fixed pattern and read-out noise which we covered in Bias Frames). By matching the sensor temperature and exposure length between dark frames and light frames, we can accurately measure the dark current and subtract it from the light frames, thus achieving our first objective. Again a cooled camera offers significant benefits in this regard; we know that lower temperatures bring less dark current and so there must also be correspondingly less dark current noise, i.e. half the dark current = a quarter of the dark current noise. Since we're talking about an uncooled DSLR that point may seem irrelevant, but I'll explain shortly why it does matter. The other means by which we can minimise the effect of dark current noise is to do exactly as we did when creating our bias frames. 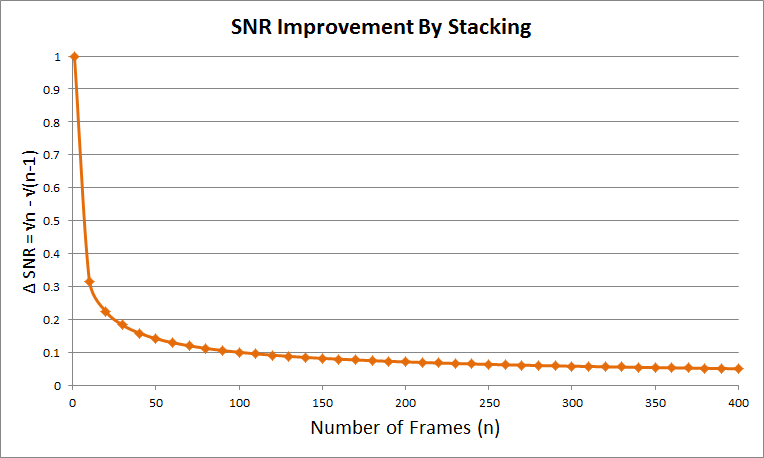 By taking a large number of dark frames and integrating (stacking) them in to a master dark we can improve its signal to noise ratio (SNR). In this case the "signal" is the fixed pattern element of the dark current and the noise is dark current noise. It is the ratio of dark current fixed pattern to dark current noise that we are interested in increasing. Okay so that's the theory but unlike bias frames, for DSLR users there are some practical problems which make it much harder to create a sufficiently large stack of darks. When I started taking dark frames, I found that the probe temperature was still higher than that for the light frames, so for my second attempt I put freezer ice packs around the camera to supplement the fridge's rather puny cooler. This enabled me to take darks at similar temperatures to the lights, but I did have to take more care to avoid condensation dripping in to the camera's electronics. Even so I found that after a few ten minute dark frames, the probe temperature would start to creep inexorably upwards. By adding a 20 to 30 minute pause between each dark exposure so the camera could cool I was able to get the probe temperature stay in the region of 9 - 13°C, thus matching the typical probe temperatures of my light frames. (Your own mileage will undoubtedly vary). Is the Camera's Temperature Probe Reliable? Canon cameras do have a temperature probe somewhere inside the camera body, and the temperature registered by the probe is recorded in the EXIF data in the RAW image file. Your camera software may contain a utility that allows you to inspect the EXIF data, but if not you could try something like ExifTool. Most usefully, when using an imaging package like APT or BackyardEOS it is also possible to have the probe temperature form part of the image's file name when it is created. So the first test was to determine whether the camera's temperature probe accurately reflects the temperature of the sensor over the duration of an exposure. If so, it would be simple to sort and match dark and light frames by reference to their recorded probe temperatures. 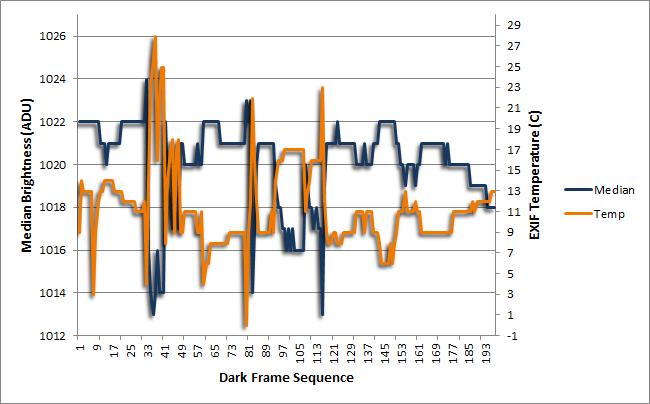 In theory, the median brightness of a dark frame should be proportional to both the sensor temperature and the exposure duration, and in practice this is usually the case for well-behaved CCD cameras. (See "Evaluation of the accuracy of the dark frame subtraction method in CCD image processing" - Lévesque, Martin P. & Lelièvre, Mario). Using the 'Plugins -> Analyze -> Batch Measure' option in ImageJ you can obtain a fair few different statistics from a set of images and save them to a text file for analysis. Unfortunately I later found that I wanted additional statistics that are not available in ImageJ but are available in PixInsight's Statistics process. The latter tool can only be used on a single image at a time, and all the cutting and pasting of numbers soon became rather tiresome. The 'simple' answer was to take a year out of this project and write the PixInsight BatchStatistics script (details here). Use the 'Add Files..' button to add all the dark frames that you want to measure to the file list. Uncheck the 'Normalize' and 'Unclipped' check boxes, and set the 'Number Format' to something appropriate. 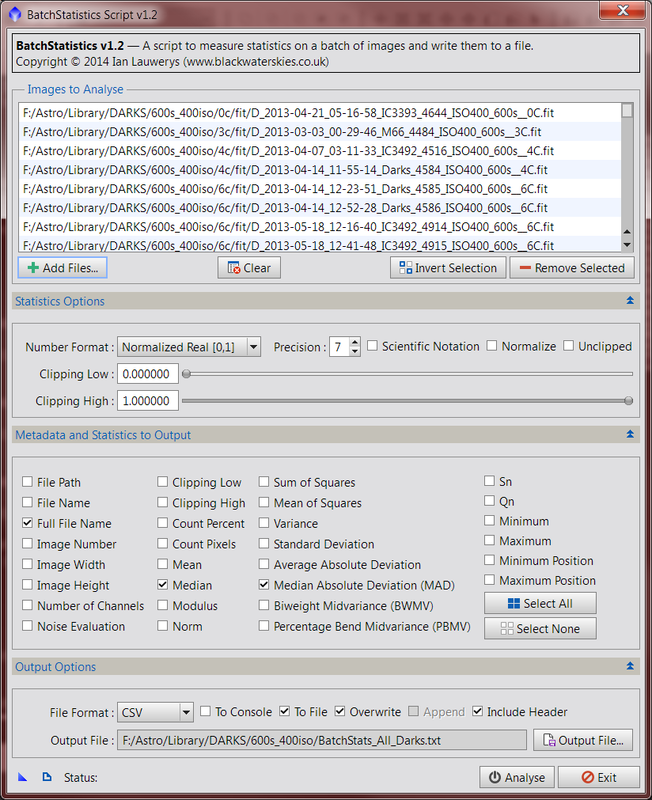 By default PixInsight converts the integer ADU values to its Normalized Real format. If you want the values in camera ADUs instead, then you'd select the appropriate bit depth from the 'Number Format' drop-down. Canon DSLRs normally use 12 bit or 14 bit format depending on the model, and most modern CCD cameras use 16 bit format. Check 'Full File Name', 'Median' and 'Median Absolute Deviation (MAD)' as the statistics to output. Use the 'Output File..' button to set a file name and location for the statistics, and choose 'CSV' as the 'File Format'. Use the 'Analyse' button to generate the statistics. Note that the more statistics options you choose, the longer this process will take, so only use the ones you really need. Note that the columns headed 'Median_0' and 'MAD_0' are the median and median absolute deviation of the first channel in each image. These greyscale dark frames only have a single channel (channel 0). I also created a 'Date-Time' column and entered the date and time of capture of each dark frame, again from the file name. Finally I sorted the entire list in ascending order of capture date and time (using Excel's 'Sort' function). 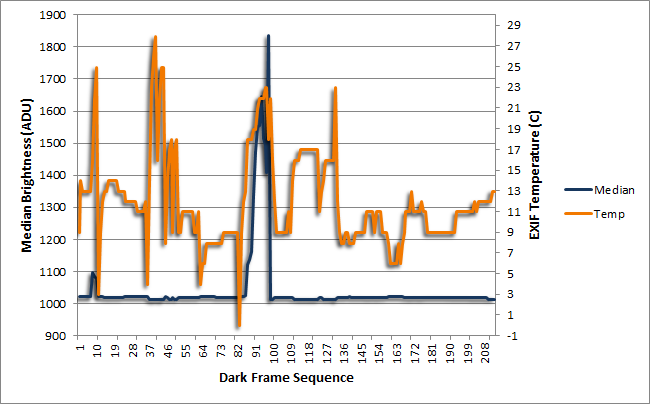 The EXIF temperature (orange line) fluctuates quite markedly over time. Bear in mind that these dark frames were captured in multiple sessions and not in a continuous sequence, so we'd expect some big temperature jumps between the end of a session and the start of the next one. Nonetheless, on examining the data, it was quite clear that the reported temperature fluctuated a lot over the course of individual sessions despite my best efforts to control it. 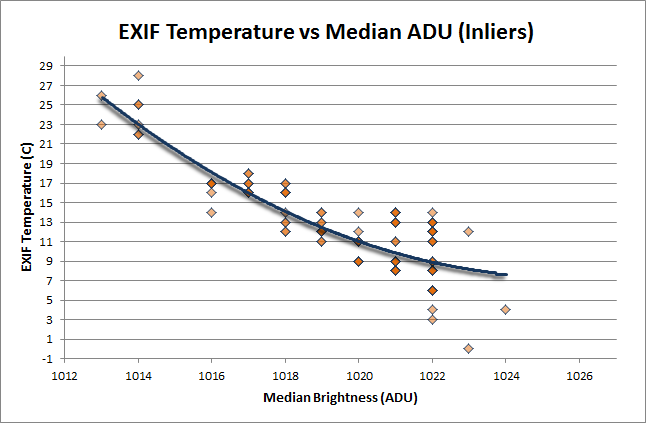 Notice that the EXIF temperature increased significantly for these 'outlier' dark frames. This is not surprising as I was not making any effort to keep the camera cool. What is important are the equally large spikes in the temperature at other times during dark frame capture. The first lesson we have learned is to be wary of relying on the camera's temperature sensor alone to judge the quality of dark frames. By measuring the images statistically, it was relatively easy for me to identify and weed out any rogue frames cause by poor technique or other transient issues. The MAD is a measure of variability of the individual pixel values in an image. Given that my dark frames are a set of (nearly) identical images, any change in the MAD between images should be proportional to the amount of noise that each contains. Given that dark current and dark current noise both increase as temperature increases, the MAD enables us to double-check the strange result above. You can see from the graph above that the MAD (generally) increases with temperature as we'd expect. Note: We use the MAD in preference to the Standard Deviation or Variance as it is a more robust estimator of scale, i.e. outliers like hot pixels and cosmic ray hits won't affect our results as much. To be perfectly honest, I wasn't that surprised. 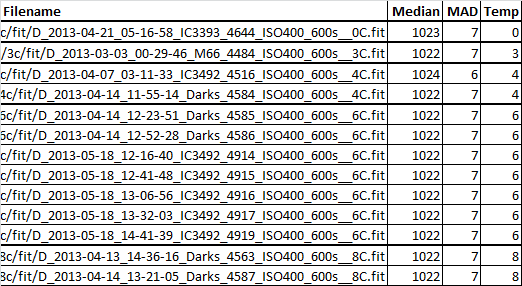 As noted by Craig Stark in his article Profiling the Long-Exposure Performance of a Canon DSLR, the RAW image files produced by Canon DSLRs are not the same as the 'pure' output files created by an astronomical CCD camera. The Canon pre-processes the image on-camera before creating the RAW file, whereas a CCD will typically give you an unadulterated measurement direct from each sensor element. You can read the details in Craig's article, but in short, the Canon DSLR seems to try to minimise the appearance of dark current. 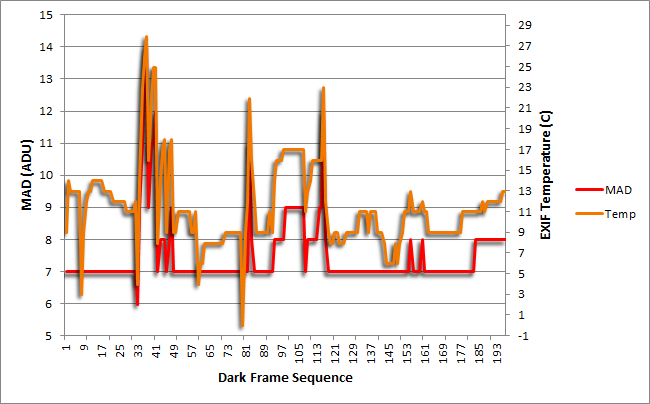 In his tests, Craig found that dark frames get darker as the exposure length increases, at least for shorter exposures. He also found that the trend reversed for longer exposures with the dark frames brightening again. My own tests reproduce the first part of this result, showing that the appearance of dark current decreases as sensor temperature increases. In both types of test, measuring the dark current noise shows that more dark current has accumulated (as required by the laws of physics! ), but that the camera processes the image to make it appear darker instead of brighter. On a more positive note, it is clear that for my Canon 500D, the temperature sensor does bear some relationship to the imaging sensor, as demonstrated by the "EXIF Temperature vs MAD" graph above. Subject to the caveat about eliminating outliers noted above, in the case of this particular camera it would be reasonable to use the reported temperature to match dark frames together in order to create a master dark. We don't know if the sensor heats up linearly during the exposure. If it does then we could average the start and (rough) end temperatures of each exposure to match darks and lights which have the same averages. If the sensor heats non-linearly or unpredictably, then we may be wasting our time. Bear in mind that it is usually the case that much more heat is generated when the image is being read out of the sensor at the end of an exposure, suggesting a non-linear heating/cooling cycle. 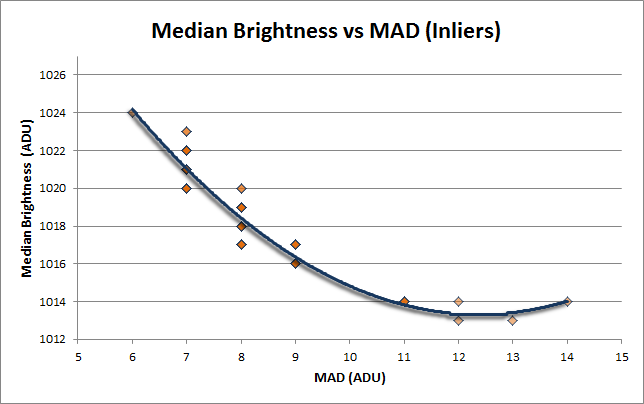 Unsurprisingly, you can see that there is a clear correlation between the median brightness and the MAD (albeit the line goes down instead of up due to the Canon's on-camera processing). 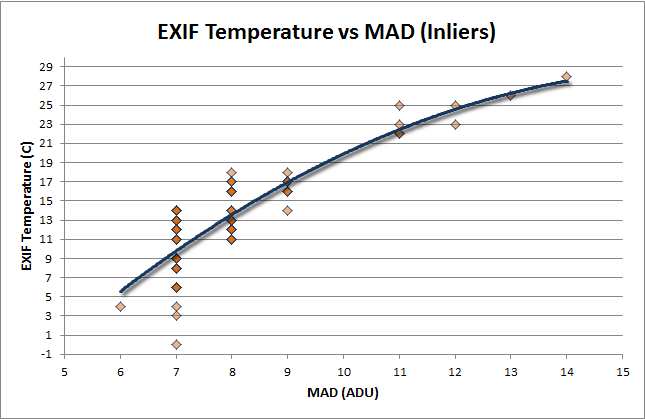 If your own graph shows a similar correlation, then you can try to match dark frames using the MAD instead of the EXIF temperature, as I'll show in the next part of this series. If there is no clear correlation between these two values then you're out of luck. It might be that your DSLR is also performing some kind of noise reduction on the image before you get hold of it. All you can do is take your best guess at matching dark frames to make a master and test their effect on your images. Again I'll show you how to do this later in the series. In the next part of this series, we'll look at creating and testing master darks, as well as methods for matching DSLR dark frames to light frames for best results. Great series!! Can barely wait for upcoming articles...!